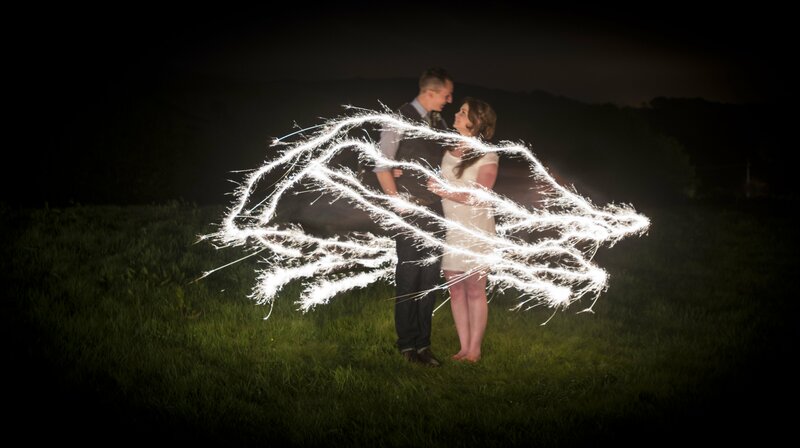 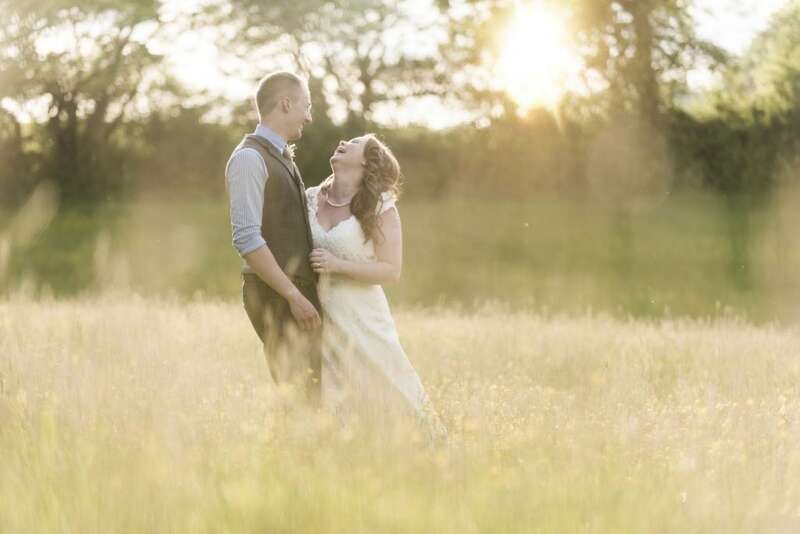 I have been looking forward to working with Aimee and Tom for a long time, in the gorgeous Purbeck hills of Dorset, with a rusty feel, and the heady feel of summer. 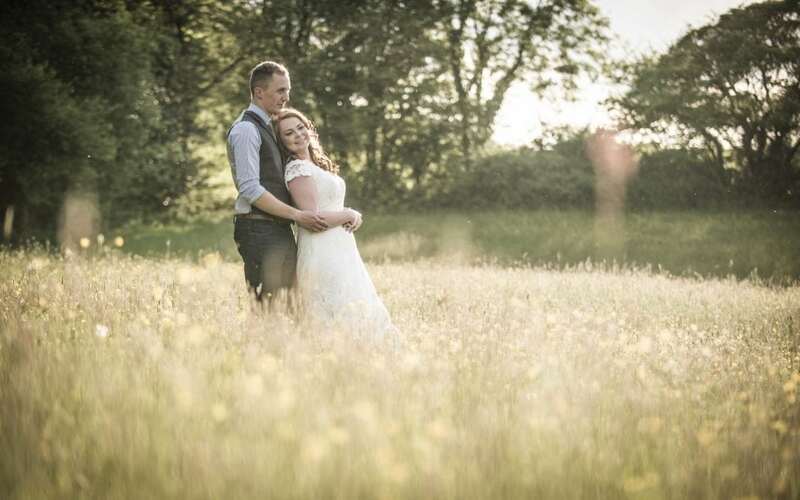 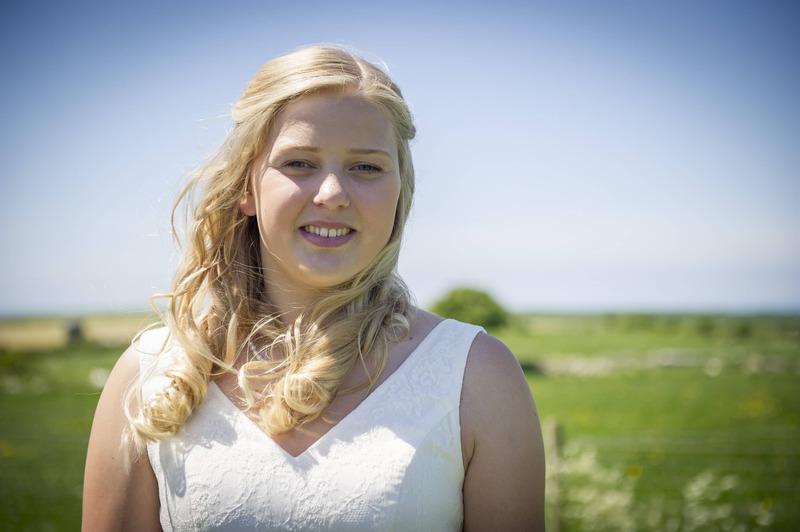 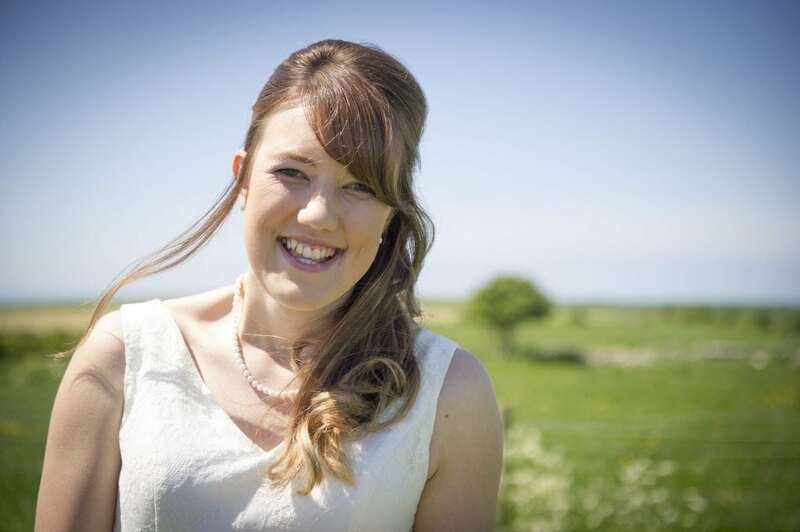 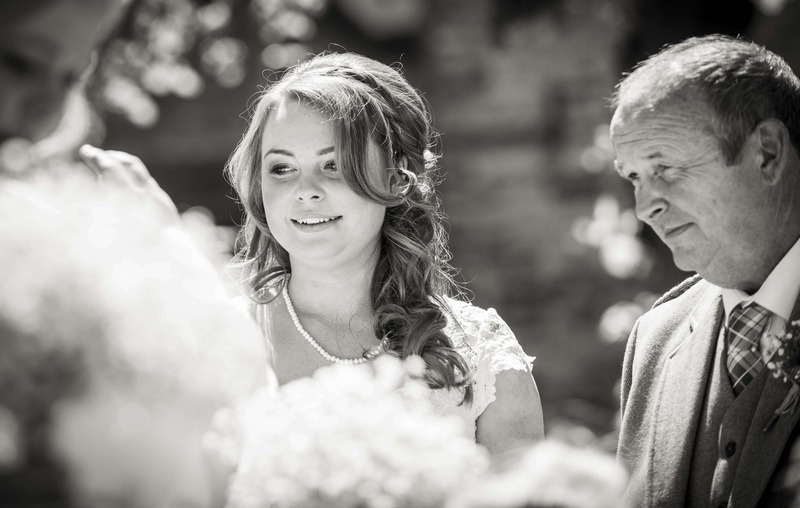 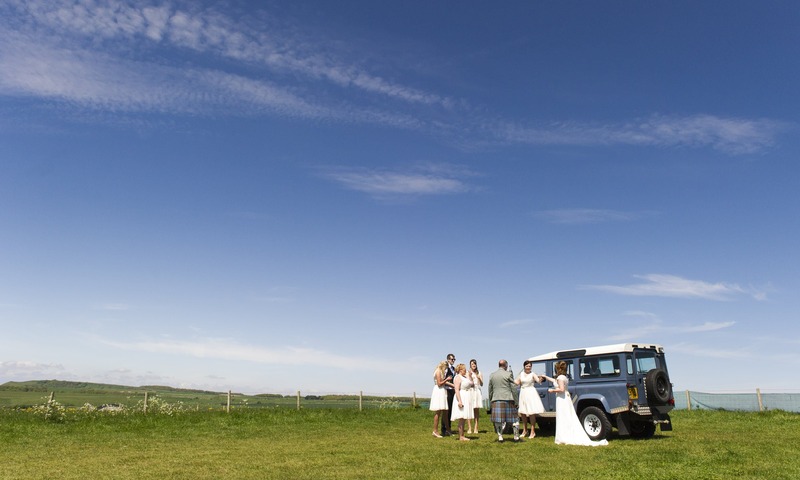 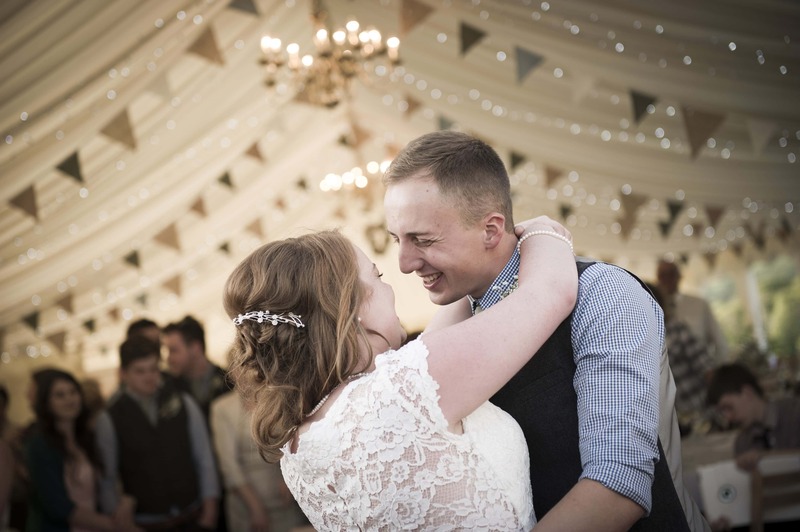 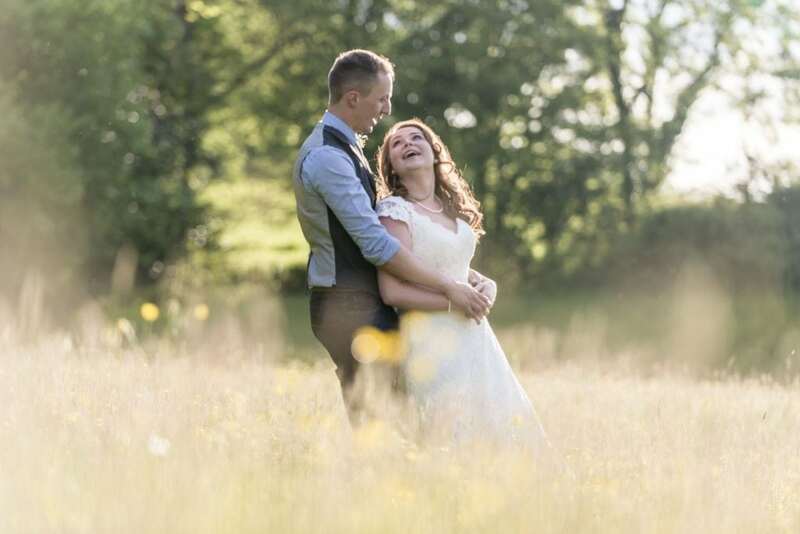 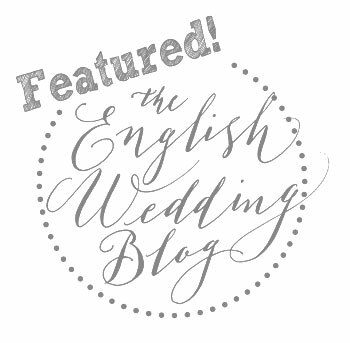 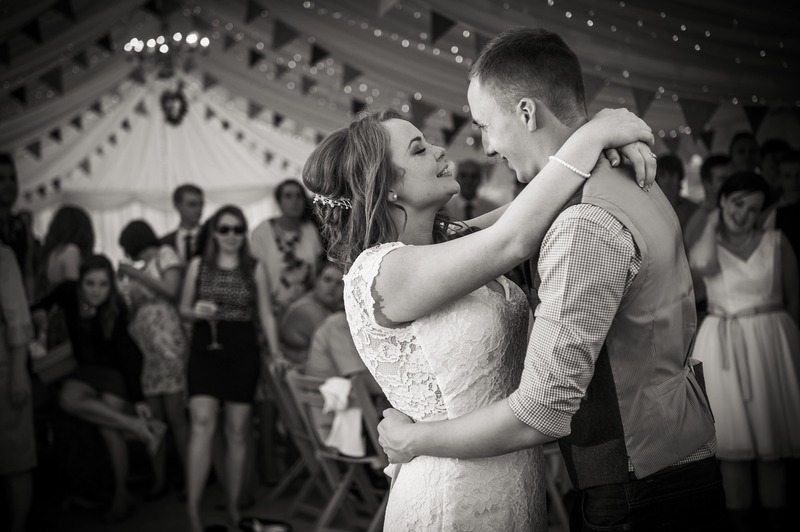 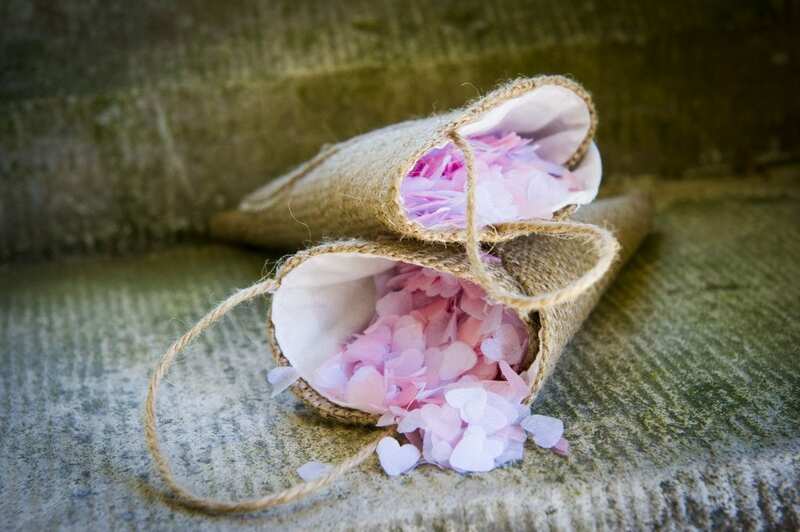 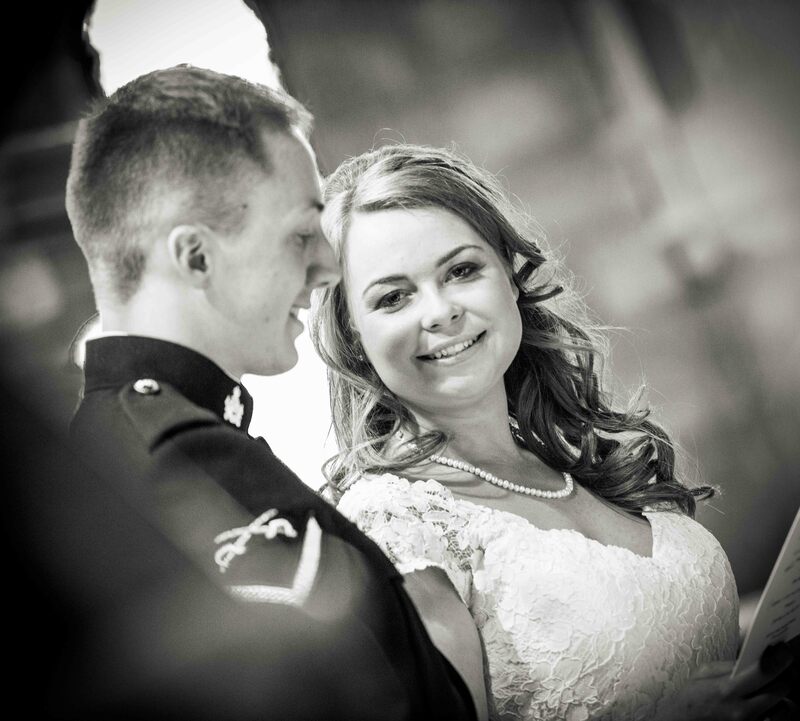 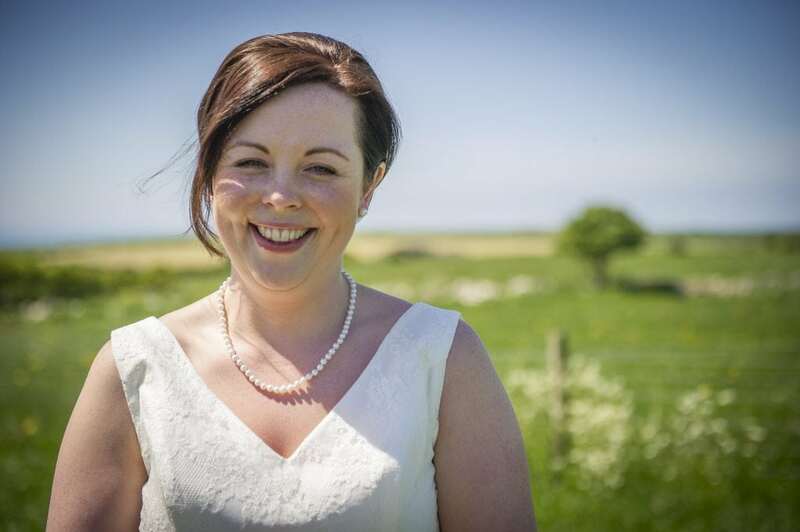 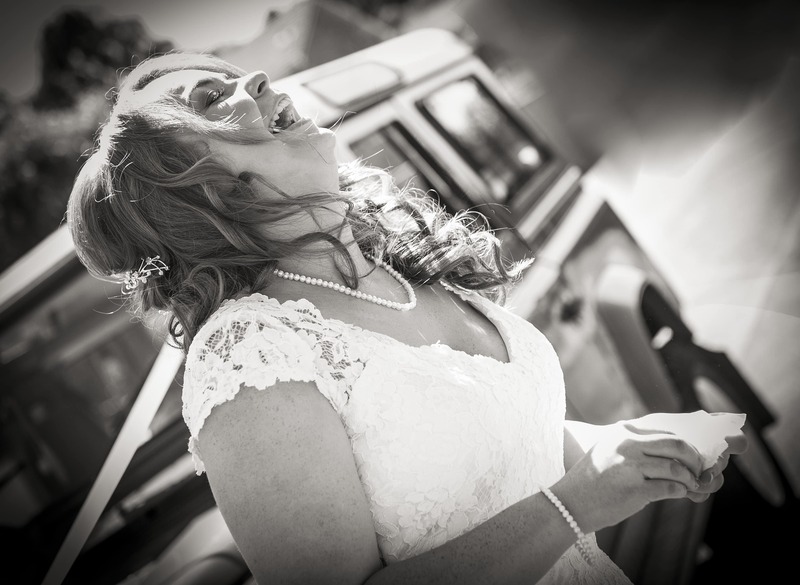 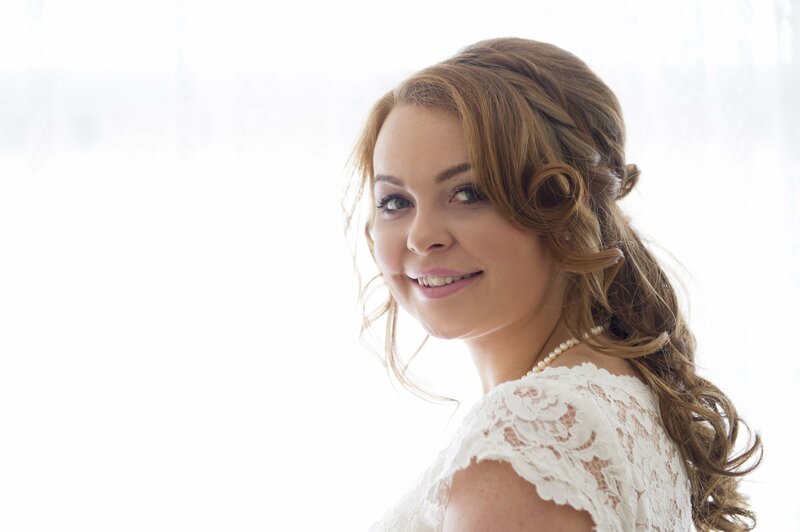 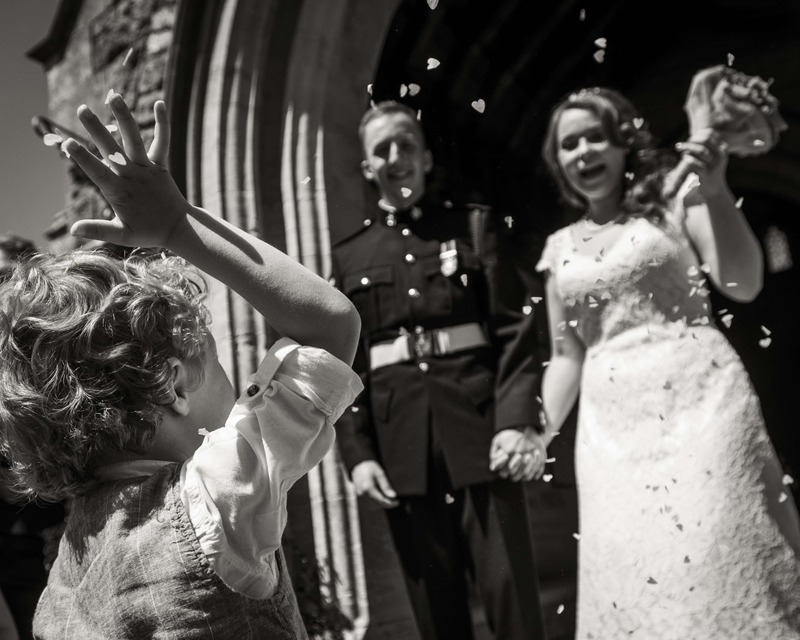 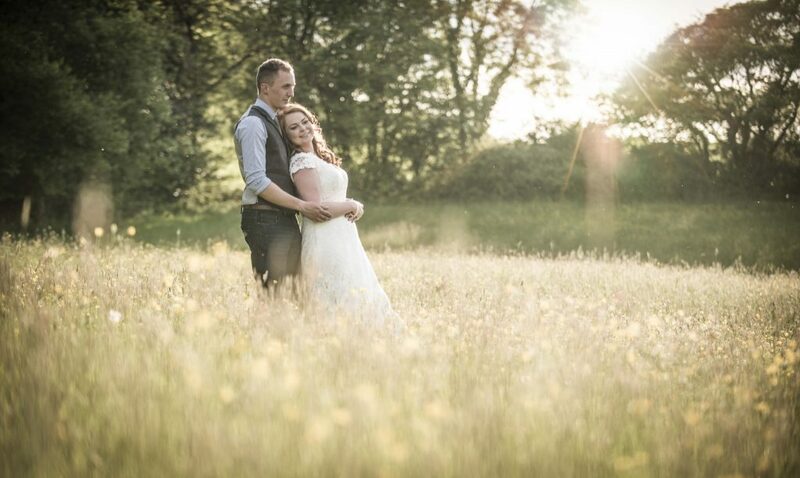 They certainly chose the perfect summer’s day for their wedding in Worth Matravers church, followed by their reception at Wilkswood wedding venue. 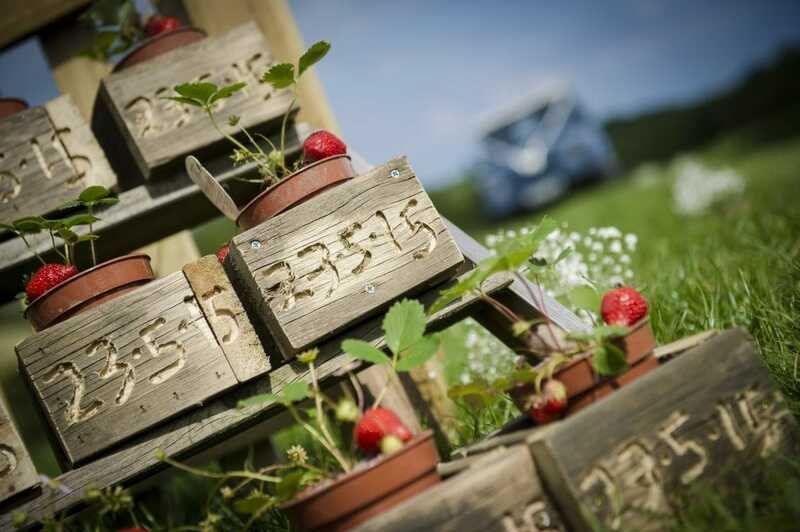 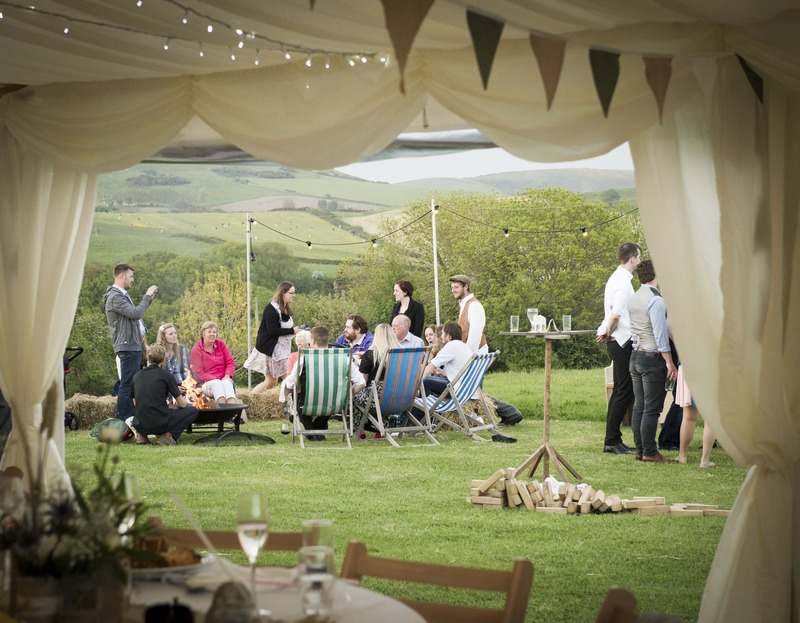 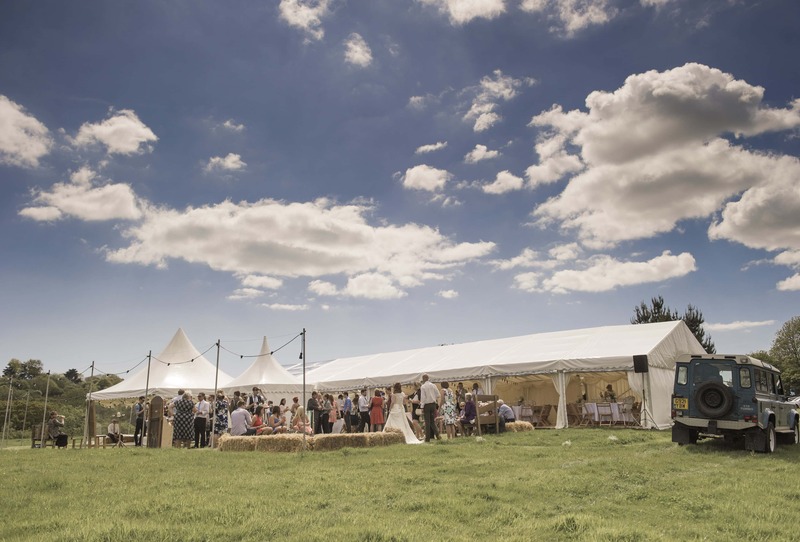 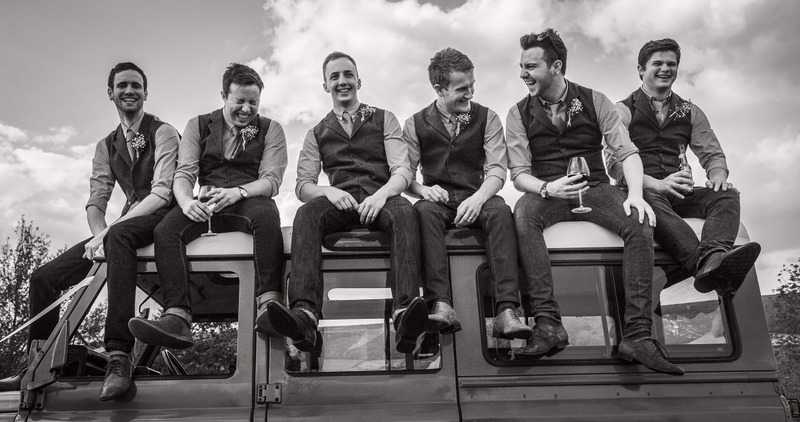 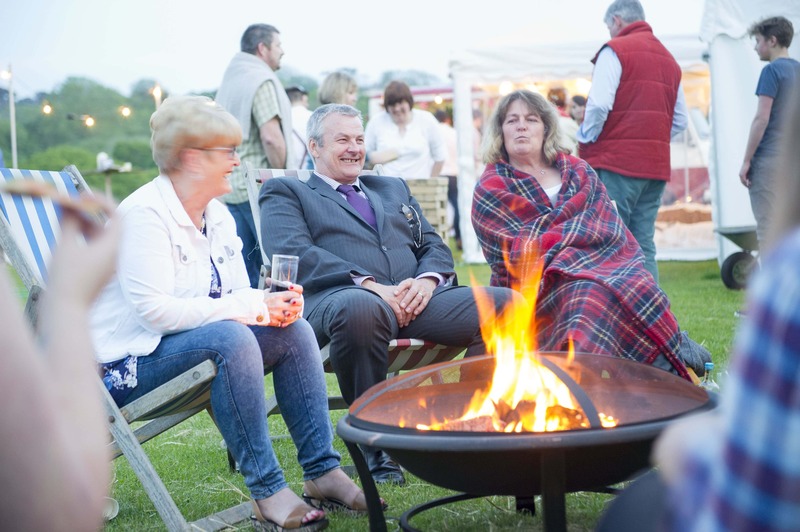 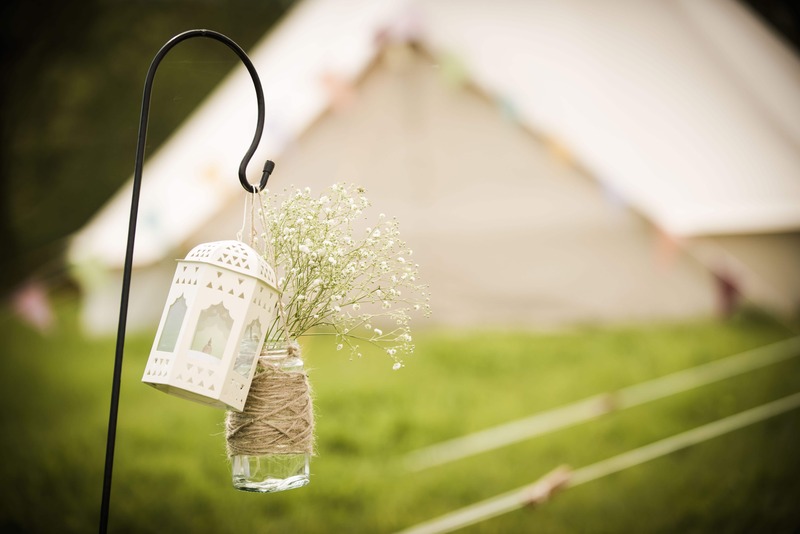 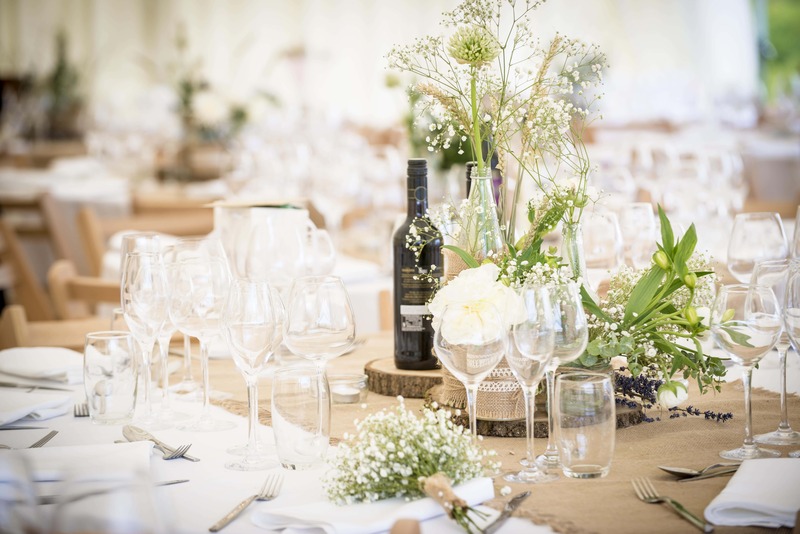 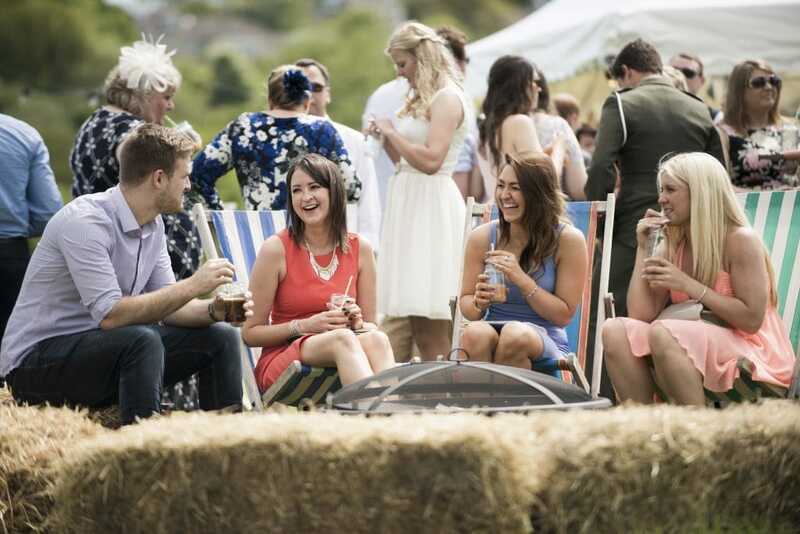 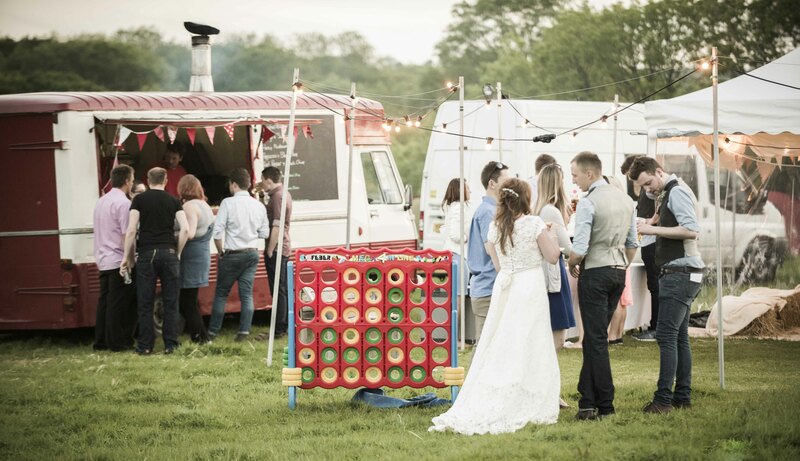 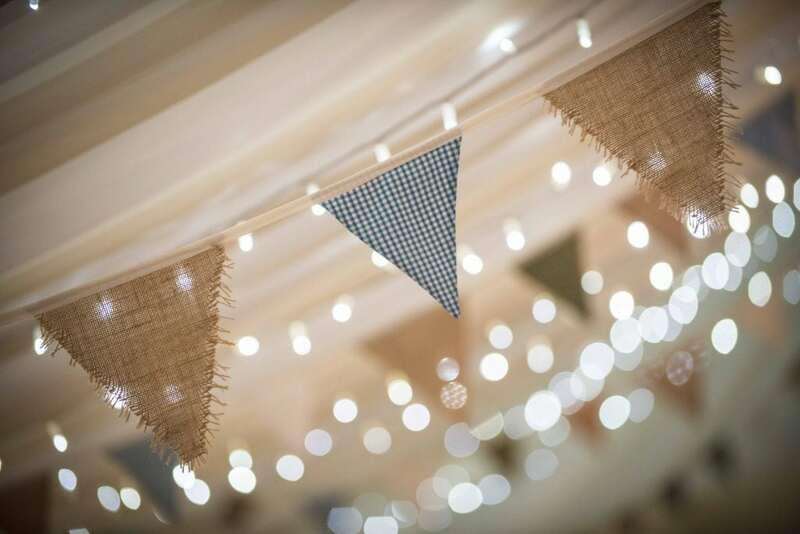 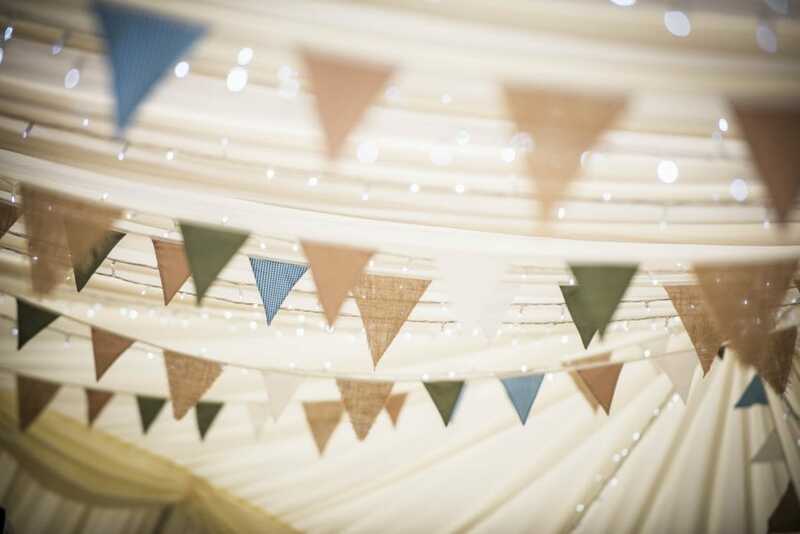 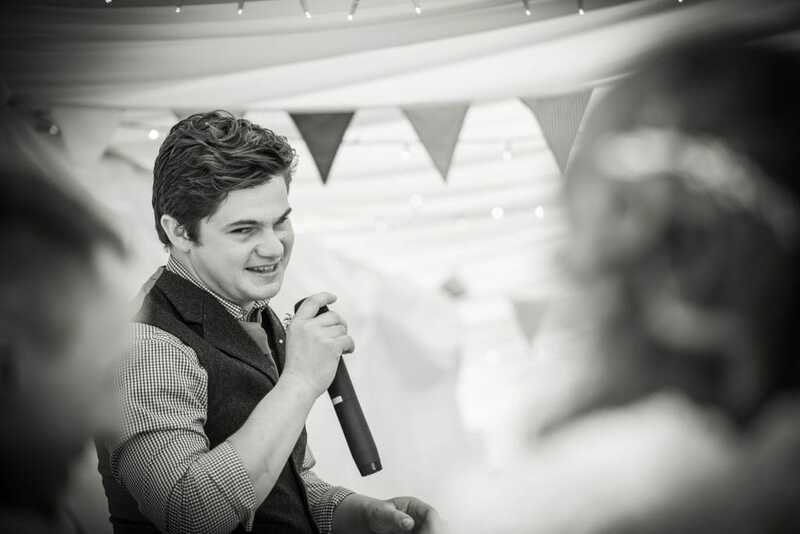 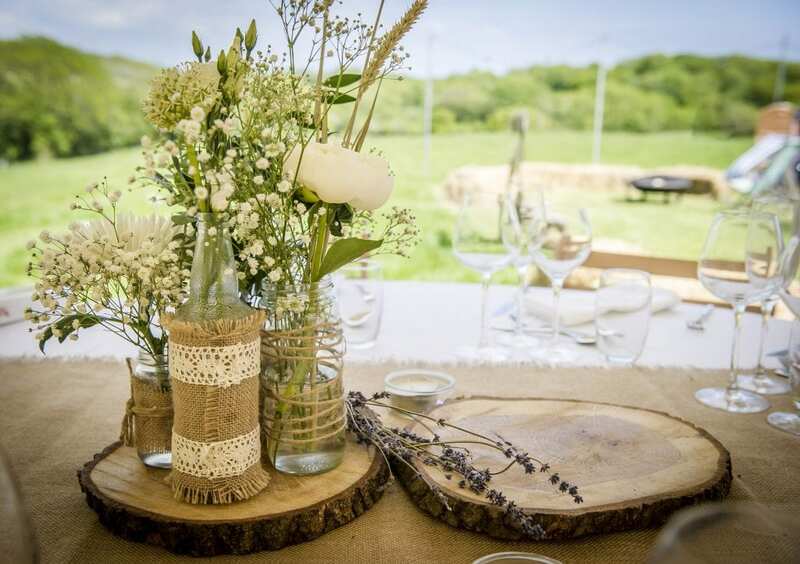 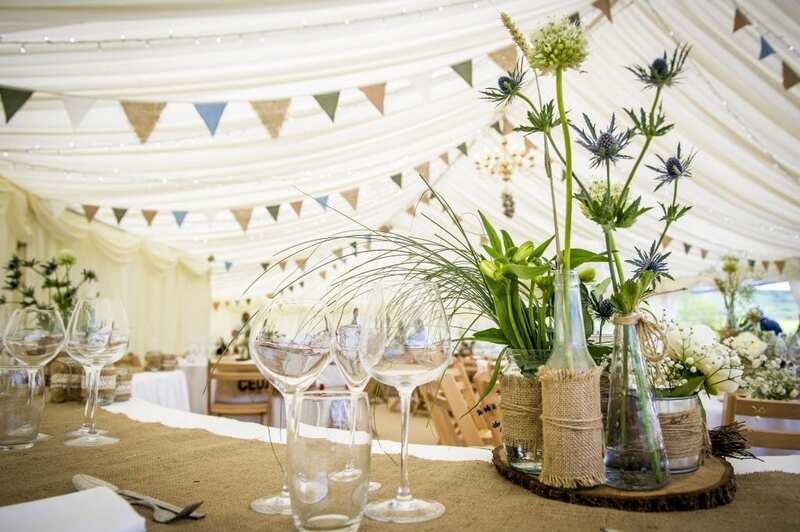 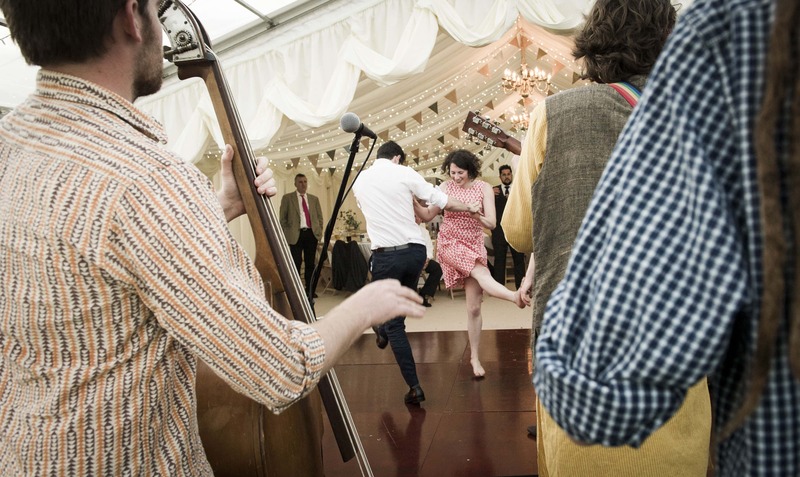 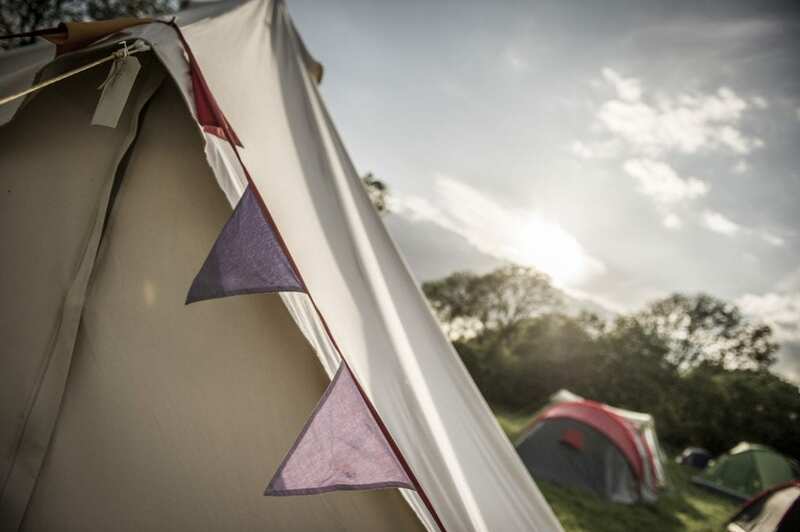 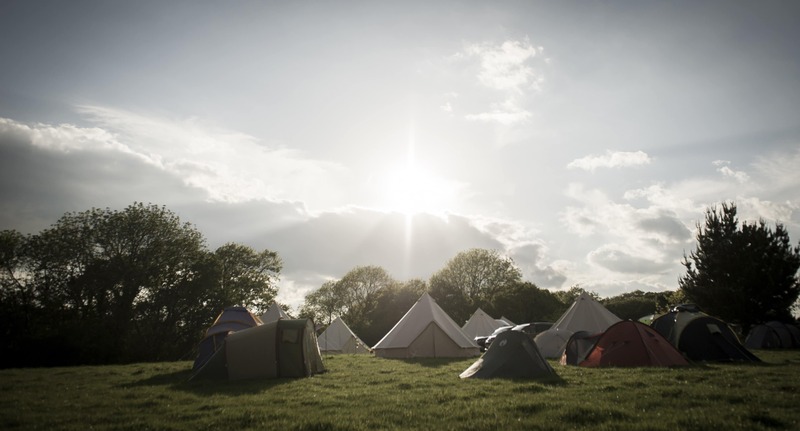 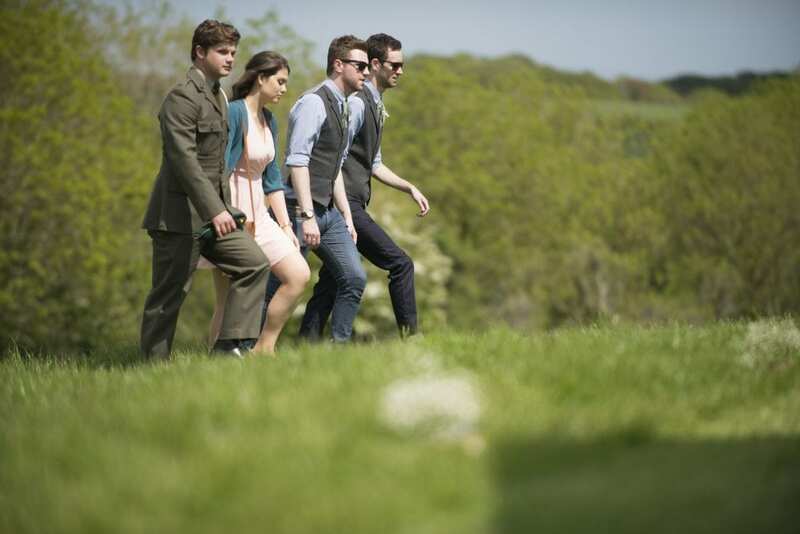 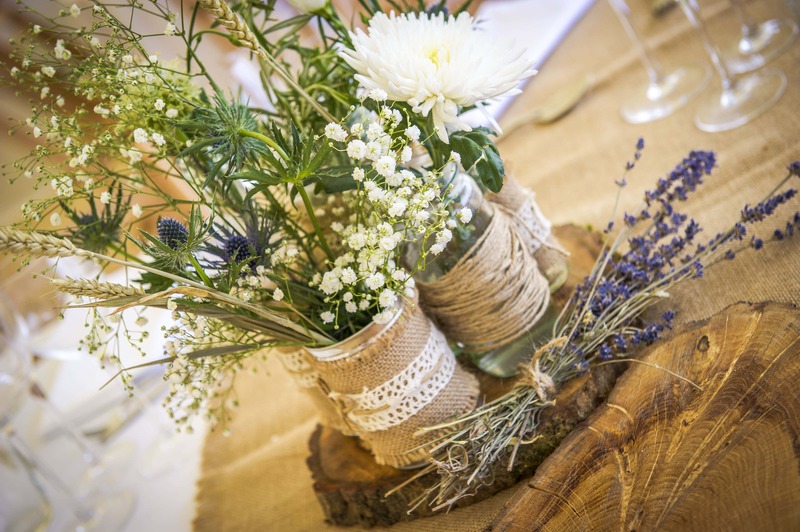 I love this area and this venue in particular, with it’s rustic feel, the stunning views over the Purbeck hills, and the whole festival feel, where guests can set up their tents and make a weekend of it, such a great way to enjoy a wedding. 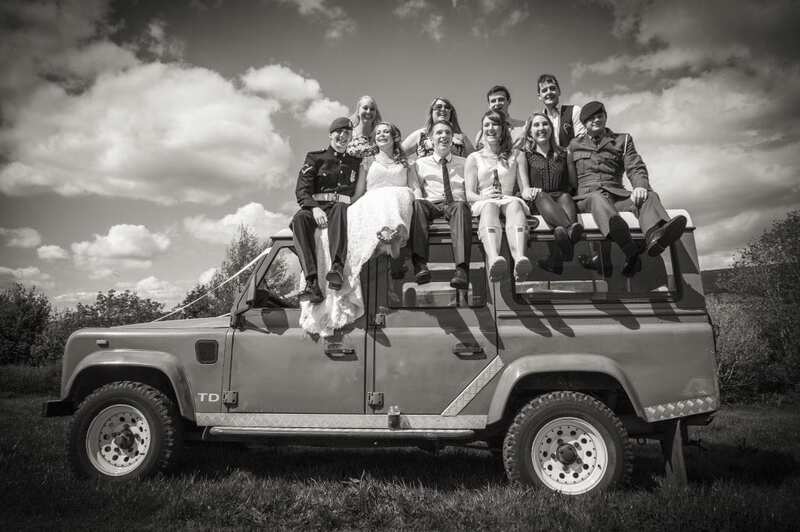 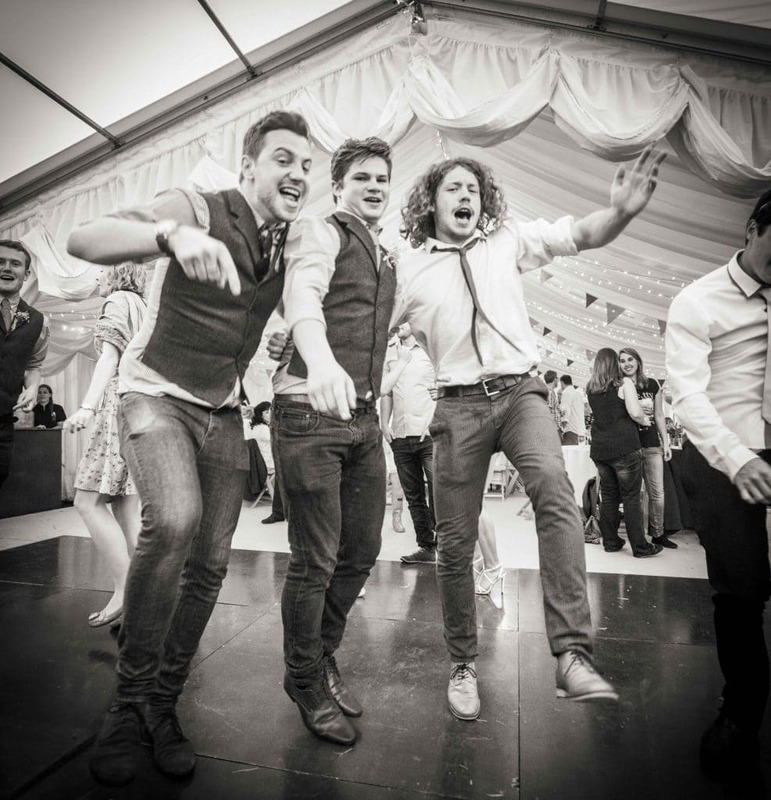 Tom wore his full army rig for the service with pride, and then at the reception things relaxed, and he joined the rest of the groomsmen in matching checked shirts with waistcoats and jeans. 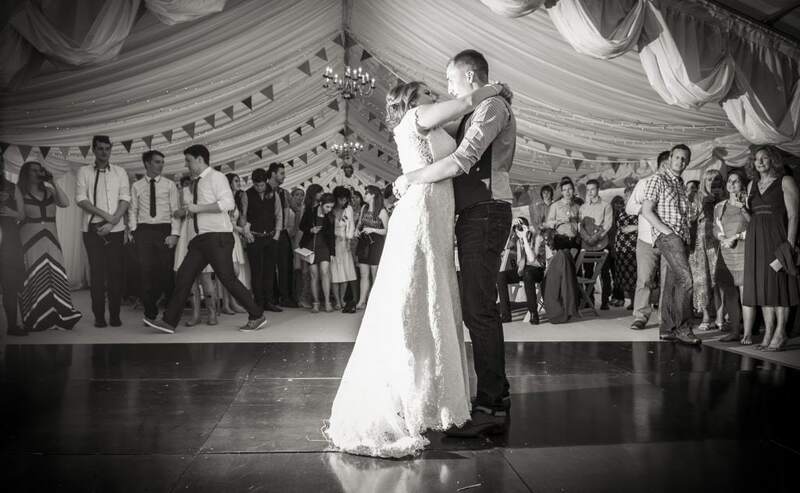 They all looked simply perfect. 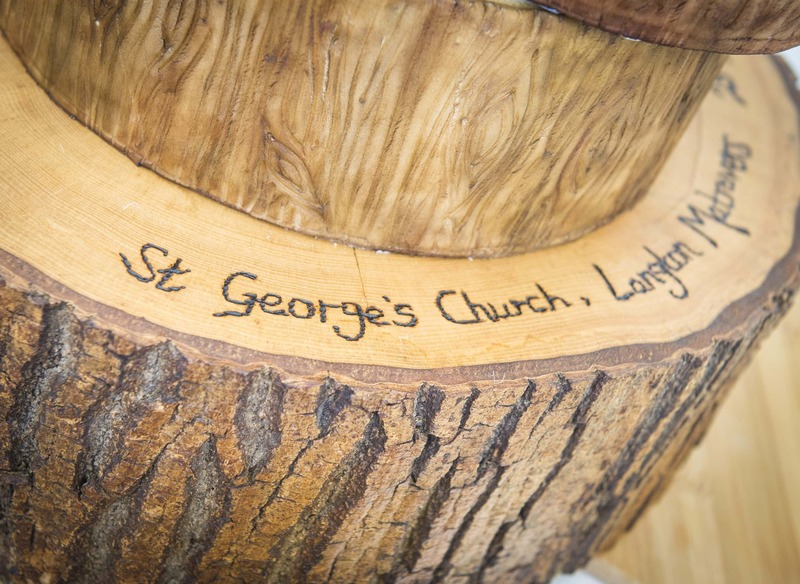 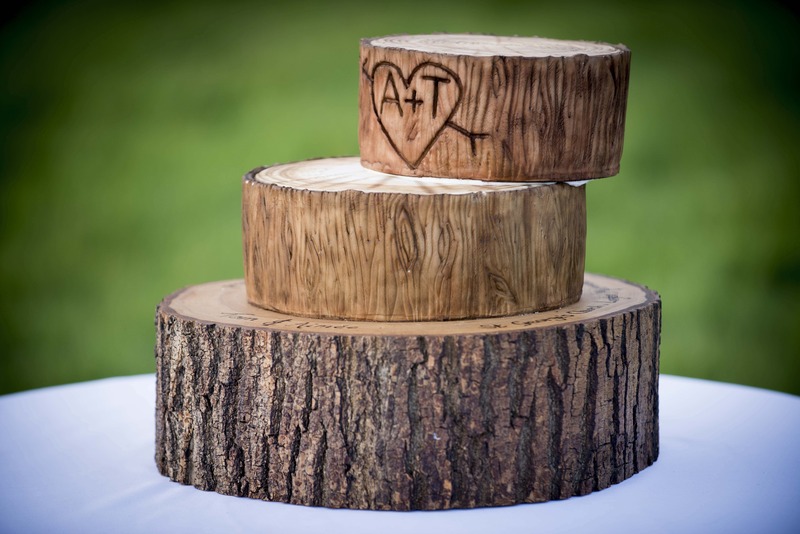 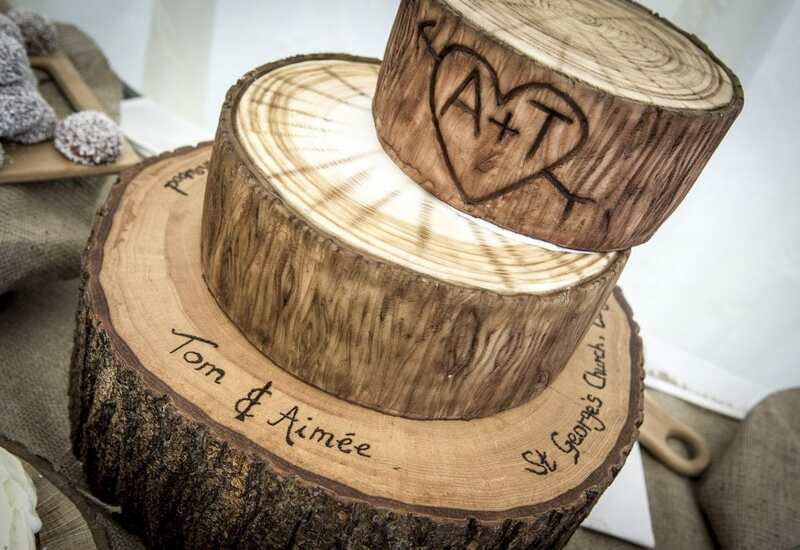 The cake was incredible, I did wait for a while for it to appear on the wooden plinth, before eventually noticing the wooden rings actually were the cake! Perfectly matched to the theme of the day, and a work of art, created by Aimee’s mum. 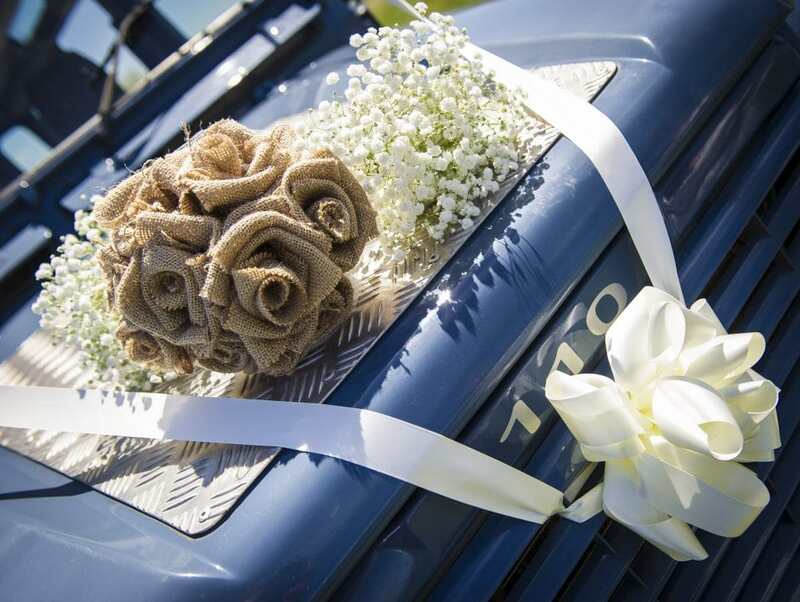 Aimee’s bouquet meanwhile was beautifully crafted from hessian and lace, not a real flower in sight, and a bouquet that will last forever. 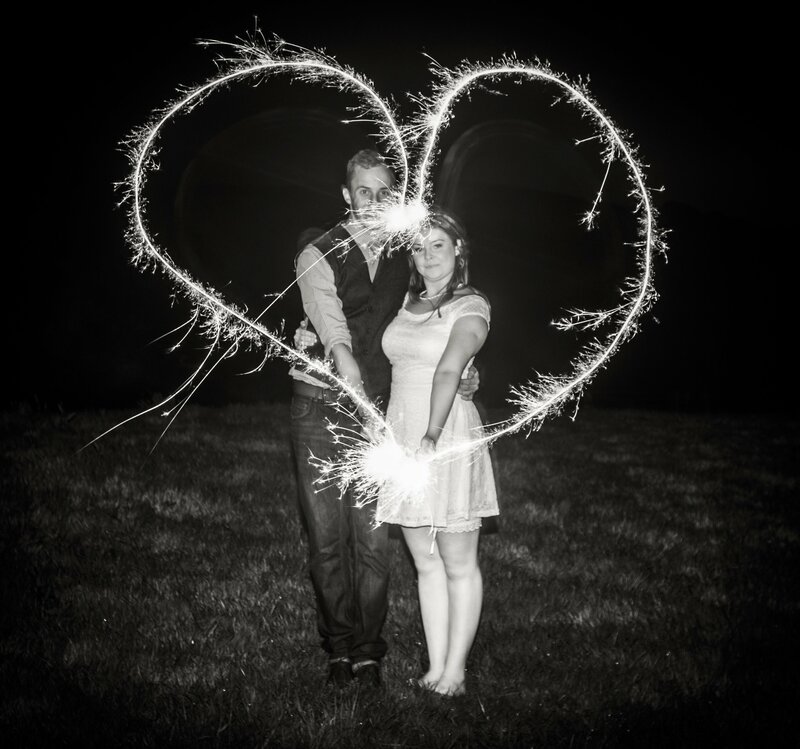 As a photographer I always encourage couples to take a break from the wedding, for some time out together, even if it is only for half an hour. 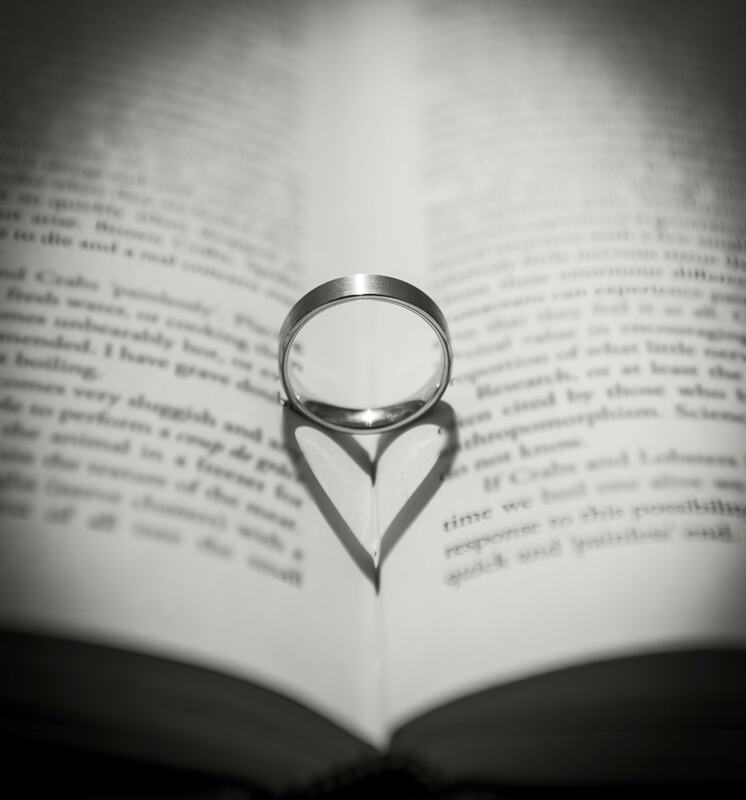 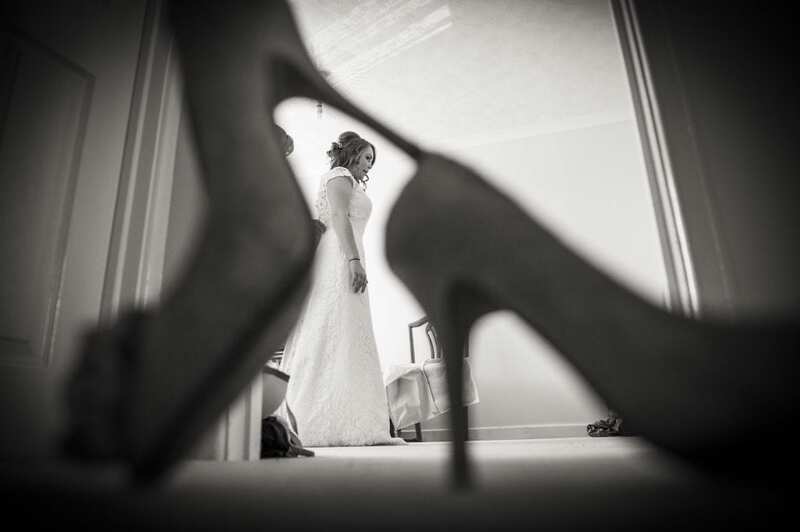 This isn’t for the creation of posed photographs, it is to allow the couple to connect, and have their first time together as newlyweds. 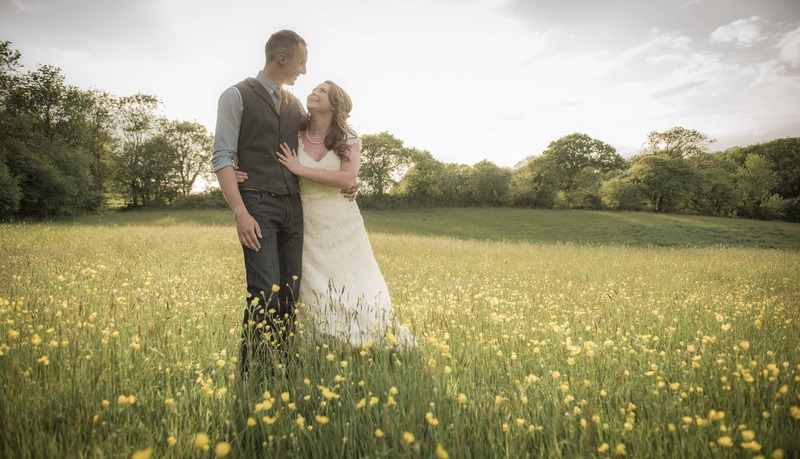 I am just there to document the moment, and the wild flower meadow at Wilkswood was magnificent. 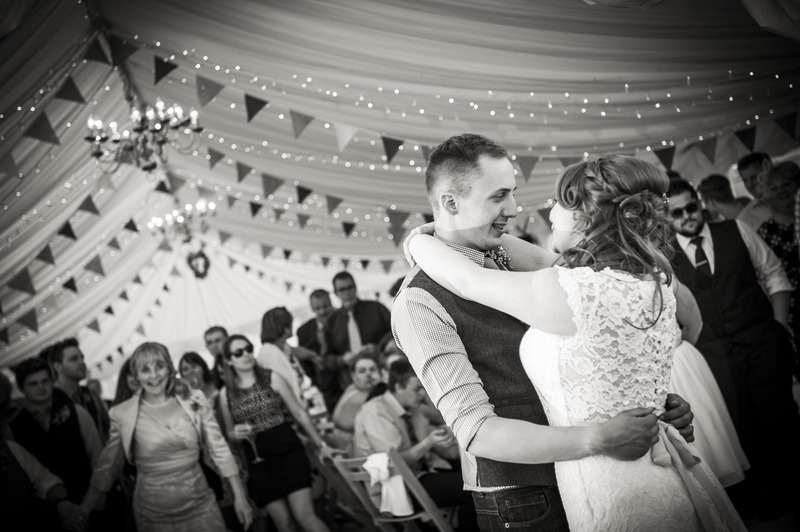 This was Aimee and Tom as themselves, no posing or direction, and this is why I love photographing venues such as this. 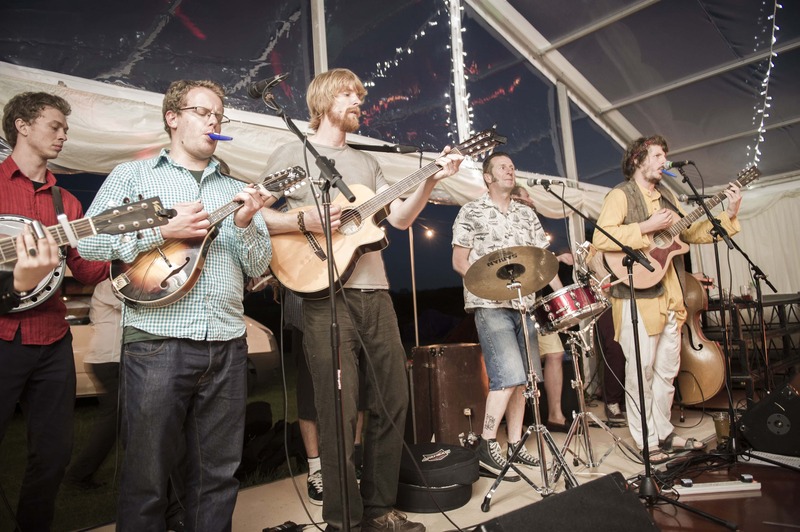 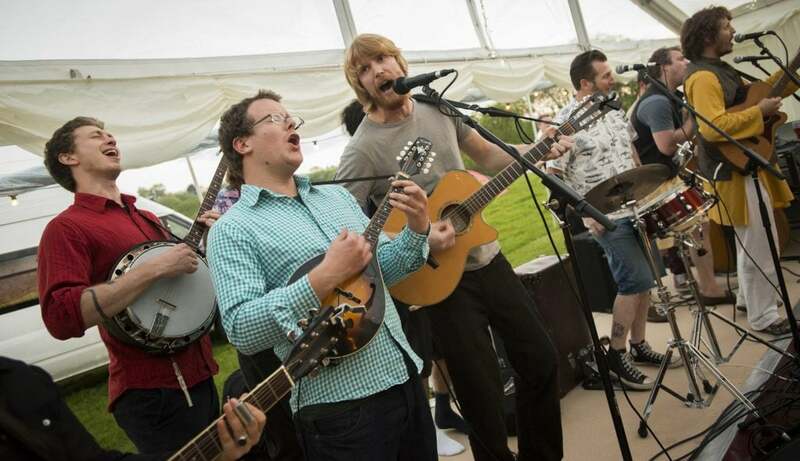 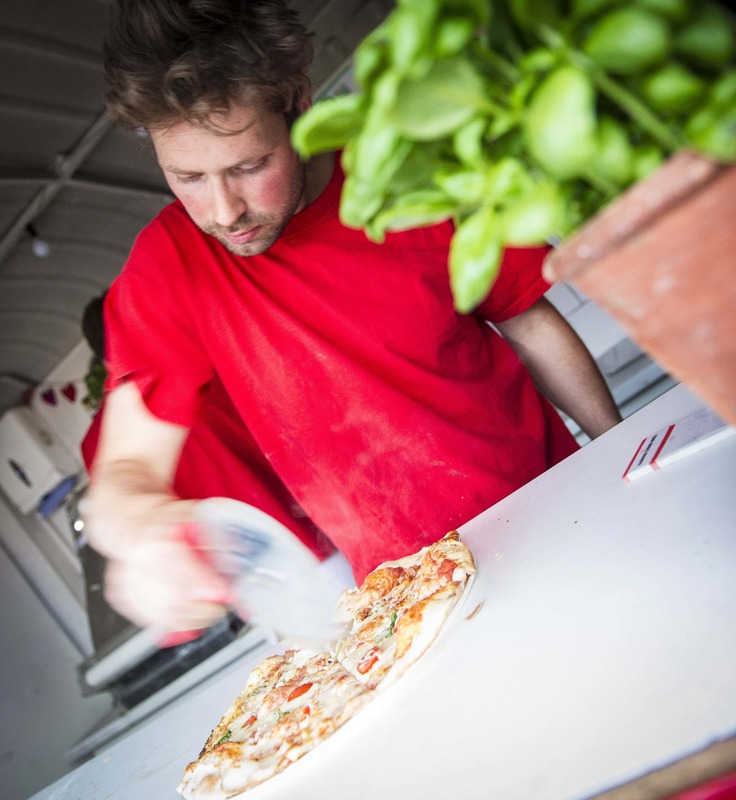 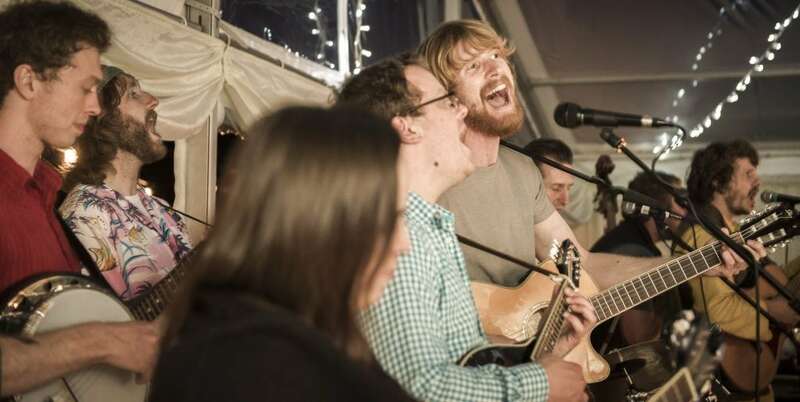 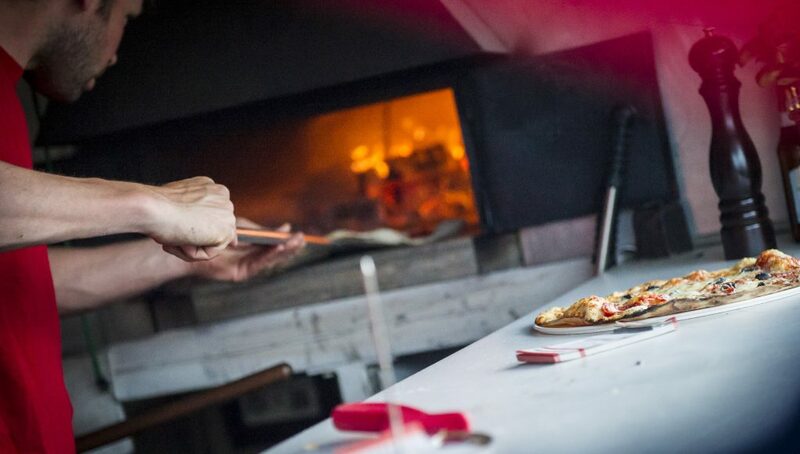 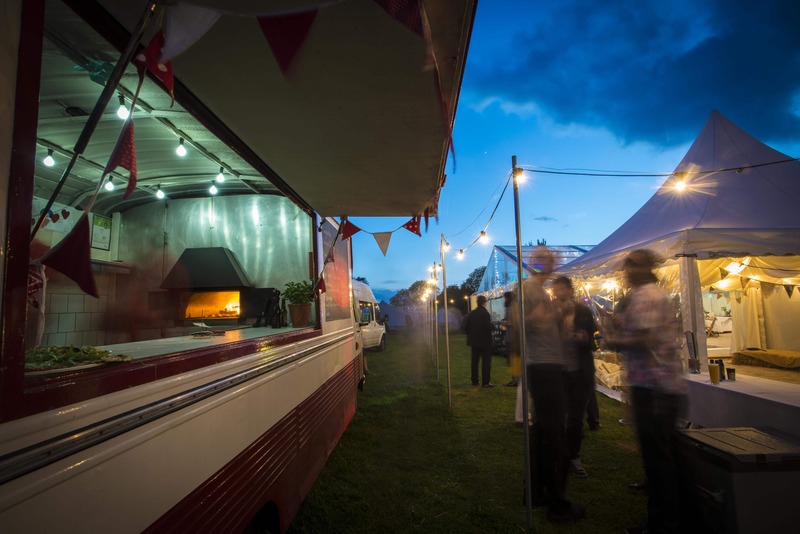 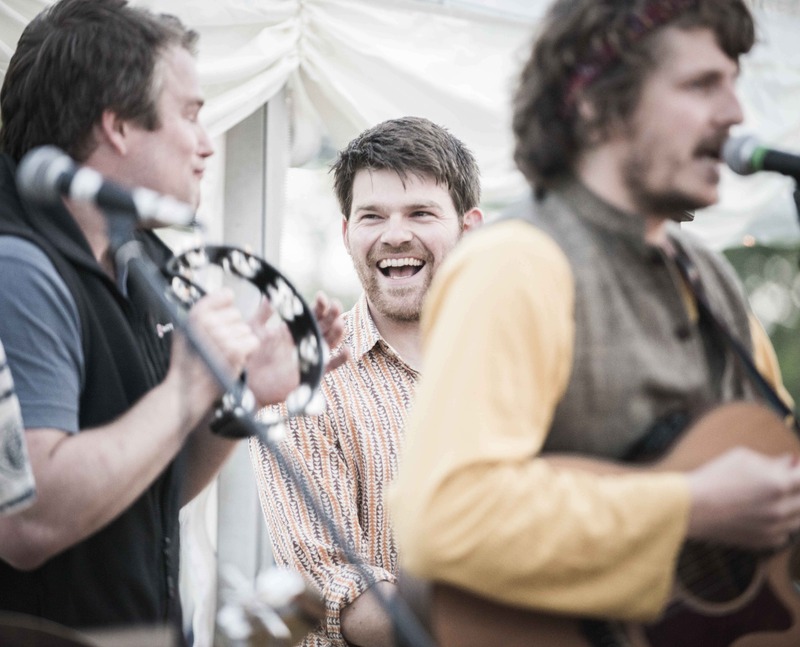 As the day drew to a close, the festival feel was in full swing, with freshly baked wood fired pizzas on demand from the Jalopy pizza van, and music from Dorset’s fines skiffle band, Quinns Quinney, who filled the dance floor as always with their eclectic take on many a classic! 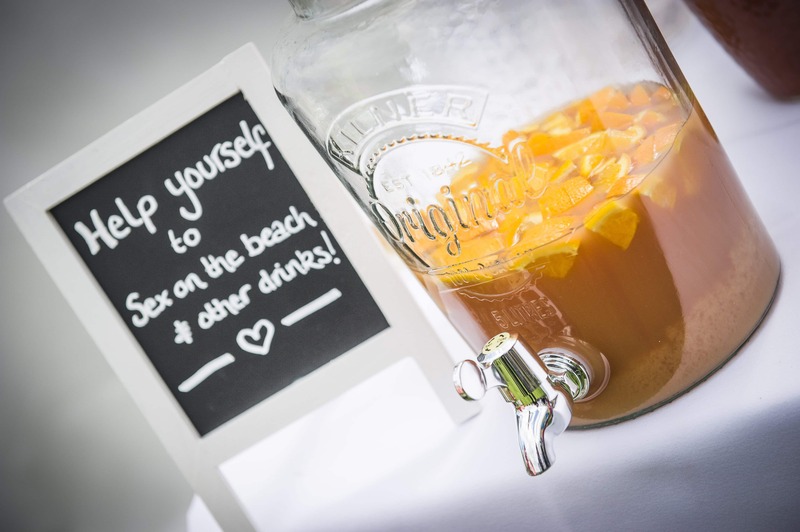 I had to resist the urge to pour a cider, and get in there myself, after a 14 hour day. 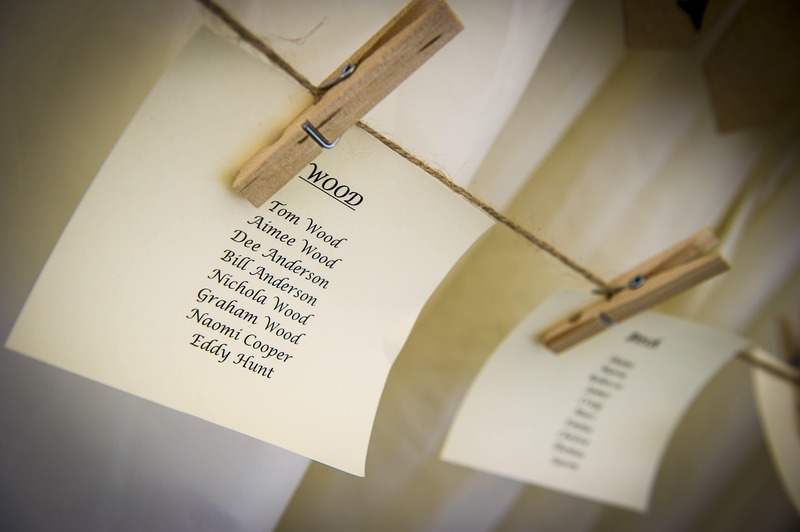 So huge congratulations to Mr and Mrs Wood! 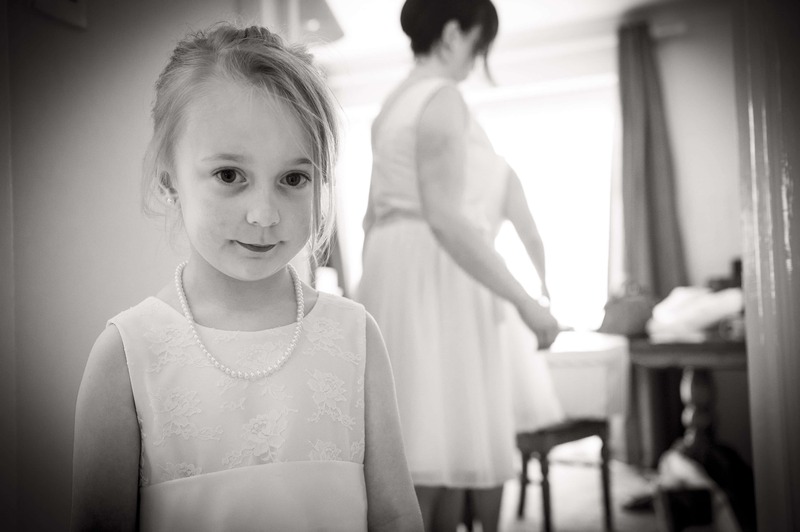 As always, I’ll let the pictures tell the story.